How much does a 30' x 30' concrete slab cost, My actual slab prices. How much does a 30' x 30' concrete slab cost? On this page I'm going to share with you what it cost to have a 30' x 30' concrete slab installed and also what it cost for slabs the size of 30' x 40', 20' x 30', and 24' x 24'. My name is Mike Day. I've owned Day's Concrete Floors, Inc since 1985. My company installs many concrete slabs every year of various sizes. These 4 sizes are pretty popular and I think it's important for people to know what they cost. Disclaimer: Keep in mind, these are my prices for installing concrete slabs for my customers in Maine. Prices could vary significantly depending on where you live and who you hire. The cost for a 6" thick concrete slab like the one you see pictured above is $5.00 per sq. ft. So 30 x 30 = 900 sq. ft.
What's included in the slab price? I only specialize in doing the concrete work. I don't do the excavation and gravel work. So preparing the sub-base for the concrete slab is not included in my prices. Can I just have a 4" thick slab instead of 6"
Sure you can. 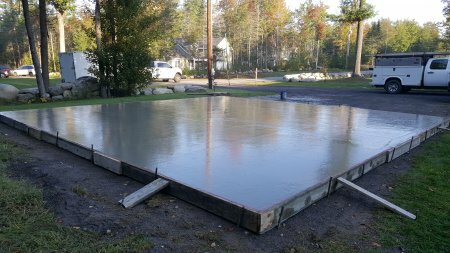 In Maine, most of the building codes require us to install 6" thick concrete slabs. If you're codes are different, a 4" thick slab with a good compacted gravel base will be strong enough for most residential garages. What are some other things that would add to the cost? 1. THICKENED EDGES: Some towns and cities building codes require a thicker edge when installing concrete slabs. They could be 12" thick, 16" or even 18" thick. We call these haunched slabs. The edge of the slab is 12" deep or more by 12 - 24" wide, then taper up to 6" thick for the rest of the slab. ADDED COST FOR THIS: $1.00 - $2.00 PER SQ. FT.
2. 2" STYROFOAM UNDER THE SLAB: Our building codes require 2" Styrofoam under concrete slabs of 600 sq. ft. and larger. The Styrofoam helps insulate the slab from the cold sub-grade, helps keep the slab from heaving and cracking in cold climate areas, and is used if radiant heat is being installed in the slab. Thicker edges and Styrofoam are the 2 things we have to deal with the most here in Maine. You may not have to consider these where you live but I thought I would include them for those who do. What is the cost of a 30' x 40' concrete slab? 30' x 40' = 1200 sq. ft.
What is the cost of a 20' x 30' concrete slab? 20' x 30' = 600 sq. ft.
What is the cost of a 24' x 24' concrete slab? 24' x 24' = 576 sq. ft. Remember, the above prices are for 6" thick concrete slabs. If you only need a 4" thick slab the prices would be a little less because they require less concrete.